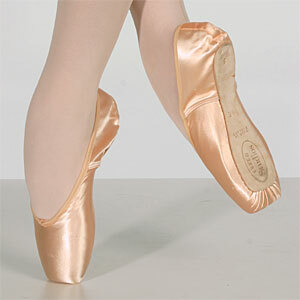 The state-of-the-art pointe shoe for the young dancer that's worthy of your feet and our name. Handcrafted in England with the natural ingredients and acclaimed characteristics of the Freed Classic. Extra durable to withstand class after class. Freed Studios feature a strong block for extra support. Available with standard or hard insole. Suede sock lining affords maximum grip. Comes with mesh bag for quicker drying. Ribbon included. Freed pink satin.